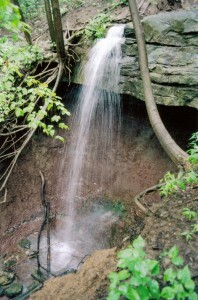 Boundary Falls is 5.9 metres (19 feet) tall and has a crest width of 1.8 m, or 6 feet. It is a complex ribbon waterfall. According to waterfall enthusiast Joe Hollick, it is interesting to visit Boundary Falls during the coldest part of the winter, as ice extends all the way from top to bottom. It is worth a visit, as it has a large overhanging cap rock that you can walk under. 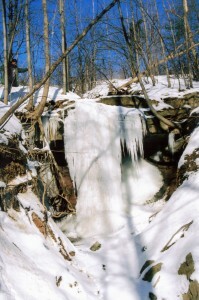 Boundary Falls is located on the boundary line of both Hamilton and Burlington, hence the name. The top is in the Waterdown section of Hamilton and the bottom is in Burlington with the boundary line running through the crest or the edge of the overhang. Boundary Falls was “discovered” by Nadeem Paracha (formerly of the Hamilton Conservation Authority) in 2004 when he was hired to document and produce the first inventory report on Hamilton’s waterfalls (completed in spring 2005). At that time 65 waterfalls and cascades had been found in Hamilton. It took a fair amount of work by both Nadeem and Joseph Hollick doing mapping and GPS measurements to determine that Boundary Falls was on the boundary line of two cities. You can access the waterfall if you follow the Bruce Trail from Great Falls at the Smokey Hollow area for about 20 minutes, cross over the Grindstone Creek when you see Lower Snake Falls (located in Burlington), follow the tributary of the Grindstone Creek upwards past Lower Snake Falls until you almost reach Snake Falls (or Upper Snake Falls). You will see another ravine on the right side, follow it up about 100m to Boundary Falls.